Taipei, Taiwan, April 10, 2019 – QNAP® Systems, Inc. (QNAP) today launched the TR-002, a 2-bay hardware RAID expansion enclosure that can be utilized as a NAS storage expansion solution, and also as hardware RAID storage for Windows/macOS/Linux computers and NAS. The TR-002 connects to a PC/NAS via USB 3.1 Gen.2 Type-C and provides a dependable storage solution for various user requirements. The TR-002 supports individual, JBOD and RAID 0/1 storage configurations. QNAP NAS users can use the TR-002 with their NAS to set RAID parameters and create a storage pool by using the “Storage and Snapshots” app within QTS. Alternatively, the TR-002 can be used as an external storage device for the NAS. Windows, macOS and Linux users with limited storage upgrade options can also use the TR-002 as an expansion unit, and a dedicated QNAP External RAID Manager utility (for Windows and macOS) can help them view disk health, change RAID configurations, check logs, and update the firmware of the TR-002. “QNAP’s first QNAP hardware RAID storage expansion enclosure (the TR-004) has received wide acclaim since its launch. 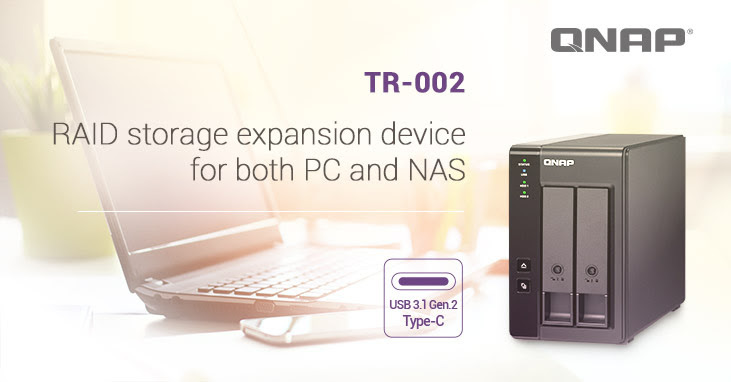 QNAP now introduces a 2-bay version, the TR-002, that comes with UBS 3.1 Gen. 2 connectivity, allowing NAS and PC users to take the advantage of TR-002’s high-speed data transfer with RAID protection,” said Jason Hsu, Product Manager of QNAP. A DIP switch on the rear of the TR-002 can switch the disk configuration. There are also status indicators, a one touch copy button and an eject button to make operations more intuitive. For compatible QNAP NAS models and usage scenarios, visithttps://www.qnap.com/go/product/tr-002. The TR-002 RAID Expansion Enclosure for NAS and PC is now available. Watch the QNAP video presentation now. For more information and to view the full QNAP product lineup, please visit www.qnap.com. QNAP Systems, Inc., headquartered in Taipei, Taiwan, provides a comprehensive range of cutting-edge Network-attached Storage (NAS) and video surveillance solutions based on the principles of usability, high security, and flexible scalability. QNAP offers quality NAS products for home and business users, providing solutions for storage, backup/snapshot, virtualization, teamwork, multimedia, and more. QNAP envisions NAS as being more than “simple storage”, and has created many NAS-based innovations to encourage users to host and develop Internet of Things, artificial intelligence, and machine learning solutions on their QNAP NAS.